Some runners who purchased the Altra Escalante 1.5 said that it was comfortable to wear. The footwear was true to size, according to some reviews. A few purchasers admired the color combination of the shoe. They said that the color schemes are compatible with most running apparels. A significant number of testers agreed that the Altra Escalante 1.5 was perfect for walking and jogging. Many runners mentioned that the Escalante 1.5 has a super fit; it also provides the ankle a secure feeling. A couple of buyers lauded the sufficient support the shoe has provide. More than a handful said that the shoe is lightweight. The upper has a breathable coverage and some testers liked it. Some purchasers noticed that the Escalante 1.5 has a more structured upper compared to the previous version. One purchaser said the fabric on the upper part of the shoe was too stretched. As a result, it made the grip on the foot not secured during exercise and running session. According to a few reviews, the sole wears off quicker than expected. The majority of the testers admired the shoe's performance in jogging and walking activities. They noted how the shoe was comfortable to the foot especially when in motion. Though one of the buyers was not satisfied because of the fitting, others still recommend the footwear because of its design and color combination. Overall, the shoe was accepted by many because of its sizing, style, and performance. The Altra Escalante 1.5 is an excellent option for those who are looking for a comfortable and well-cushioned running shoe. About half a year ago, I got my first pair of Altra shoes - the Superior 3.5. Running in the Superior 3.5 was such a profound experience that when I needed a new pair of more road-suitable running shoes, I looked towards Altra. I soon found the Escalante, and as soon as they released the Escalante 1.5 in Europe, I got myself a pair. I don't know how to put this in terms that will not completely blow this review. The Escalante 1.5 is simply the most comfortable running shoe I have tried in my entire 25 years of running marathons and ultras. Simple, classic yet stylish looking one-piece knit upper. Not only is it super comfortable, but it is also springy, fast and light. What more could a recreational ultra-runner wish for? Well, let's have a closer look! The Escalante is comfortable right out of the box. The upper is extremely soft and pliable - hardly a shoe! More like a comfy sock with a cushy outsole. It is made up of a thin and breathable fabric, and ventilation is excellent. The soft and thin knitted upper provides super ventilation but also poor protection against the elements. The heel cup is rather wide, and the ankle collar sits at a standard height. There is a lot of foam within the collar itself, whereas the lower sections of the heel cup consist of two layers of fabric only. This gives a nice soft and hugging feel around the heel and ankle. Heavily cushioned ankle collar and thin tongue. The tongue is extremely simple and thin. It is an independent unit and attached to the shoe at the very bottom of the instep only. This is perfectly in line with the rest of the shoe - light and simple. However, also one of my major gripes with it. Not a deal-breaker but definitely something to take into account. Because the upper has no structural elements, it is difficult to tie the Escalante properly. Either they end up too soft, resulting in a fair amount of in-shoe-sliding and little control or you tighten them too much ending up hurting your instep. Zero drop (no head-to-toe offset) and no real structural elements in the upper. The Escalante comes in many colors both upper and midsole. Most colors somewhat inconspicuous, others a bit more attention-grabbing (like my Lime/blue European version). Some are available in the US others in Europe. A common denominator for all of them is a wide midsole and a one-piece knitted upper with a flecked pattern — a stylish yet casual look in a normative package. The Escalante is so good looking that it easily "doubles" as a sneaker. I'm certain quite a few people will wear the Escalante as an everyday shoe. Pretty much like a whole lot of major brand shoes like Nike and Adidas. Full frontal view of the lime/blue (Europe) knit Escalante 1.5. The Escalante is one fast shoe! The springiness of the EGO midsole and the way the entire shoe propels you forward is just phenomenal. I can't recall having this much spring in my step - ever. It is quite remarkable. Not only is the Escalante springy it is also lightweight for its amount of cushioning. My pair (size UK 7) currently weighs in at 224 grams after 300+ km. The springiness and low weight in combination vouches for a very fast shoe. I trialed the Escalante head-to-head against two other reasonably fast shoes. I did this by running the same half marathon (mixed trail) in all three shoes within a week. All three runs without consciously trying to control my speed (i.e., mosey on) as I always do. The Asics DynaFlyte came in pretty much on my average speed for the route. The Inov-8 TerraClaw 220 (my favorite racing flat) was about 12 seconds faster per kilometer. The Escalante came in one-second faster again per kilometer. An unscientific test against a rather random selection of shoes will not hold as evidence in the high court. However, it is still a fairly good indication that the Escalante is a fast shoe. When it comes to ground-feel, I find the Escalante a bit of an odd beast. The 25mm stack height is quite sizeable, yet you still get a fairly good feel for what you are running on. Even on soft forest-floor type trails, you are not running completely in the unknown. Somehow the EGO midsole lets you sense the track. Perhaps the very minimal outsole is the key not only to save weight but also to provide an okay ground feel. The midsole and outsole are wide all around (as is the last). This provides a nice sense of stability and security. No fear of twisting those ankles! This is a huge plus in my book! Wide and minimalistic outsole offers a stable, cushioned yet responsive platform. When it comes to running far, the Escalante is quite good. I have taken mine as far as 30km on mixed road/trail, and I wouldn't mind taking on a marathon. One of the big pros for the Escalante is that they are so comfortable, and have ample room for the feet to splay and swell. However, it is not all rosy red. The springiness and soft EGO foam also make running a bit wearisome or perhaps disagreeable is a better word. They provide too little support near nothing from the upper and the EGO midsole is springy is not supportive. Hence, despite their super springiness, my feet tire and my footpads numb after a while. This is no good for an ultra. I have also found that running consecutive long runs in my Altra shoes (e.g., alternating between Escalante and Superior) I end up with a niggling pain on the outwards lateral side of my feet. If I then switch to more supportive shoes for a while, the pain goes away. It is highly not the shoe that is to blame; rather me and my feet, but now you know there might be issues with lack of support. Because the Escalante is so light and the upper super breathable, it is a perfect shoe for summertime runs. Not so much for cold and wet conditions! As soon as there is a bit of moisture around, your feet will be instantly and constantly soaked. Hence, not much of a cold-season shoe. Similarly, if there is a bit of dirt, sand or other bits of geology around they are bound to end up inside your Escalantes quickly. Don't even think about wearing gaiters! Okay, perhaps not that bad but you get the drift. The Escalante is not a trail shoe! As a trail runner, I miss a bit more "structure" in the Escalante. Something that holds together the shoe and upper - frankly speaking, "a bit of real shoe." Because the entire shoe is so soft, you have no sense of control. On the other hand, this is not a shoe for the rugged trails. It is clearly meant for urban conditions: straight, flat and easy routes on tarmac, footpaths and in parks. During the six+ months, I have run in the Escalante. I have had to take the occasional break from them. This because my instep hurt as soon as I put them on. The only way I can wear my Escalante today is having the laces very loose. This is of course, very comfortable. However, it also provides a rather sloppy fit with little control. Had the tongue been just a tad bit thicker, it would be easier to find some sort of equilibrium lace tightness. Or perhaps a bit of structure that could help (re-)distribute the lace-tightness across the foot? Then again, if you added those bits, it wouldn't be the Escalante - or would it? The Altra Escalante is expensive at $140/ EUR150. If you look for deals, you might find them on sale for less. Nevertheless, they are costly. Are they worth it? Well, it sure is a comfortable shoe. It's light, fast and fairly good looking! So far, my pair is holding up nicely. No build issues, and wear and tear are less than what I would otherwise expect. If I keep up their current usage, I estimate mine to last somewhere around 500 miles before retirement. Yes, I would say they are worth the money. The Altra Escalante 1.5 is without a doubt the most comfortable running shoe I have ever tried. The space for your toes is phenomenal. However, extreme comfort comes at a cost. They offer little support, and you may find you lack control. In my opinion, the Escalante 1.5 is a three-season shoe at best, and suitable for anything from urban running to light, easy trails. They are very fast and well-aligned for short to medium-long runs. Get one of the racing editions, and you'll literally be flying! As with all Altra shoes, the Escalante has zero drop, and this may take a bit of getting used to. The sizes are reasonably large, so better try before you buy - you may be able to go half if not an entire size down. The Escalante 1.5 is not suitable for rugged, technical or muddy trails with shoe/toe-destroying obstacles. I find that they are not suitable for ultra runs either, because of the soft midsole and minimal outsole. You may think otherwise, but go try it out, it is worth it! Altra Escalante's 1st model has been my favorite road shoe so far. The lightweight, flexible upper part, wide toe box and perfect cushioning. This was a better version of the Nike free RN which I used to love for road running. Since I am such a fan of the Escalante, I was pretty sure the 1.5 wouldn’t let me down. As soon as I put on those brand new kicks, I felt the well known and amazing Altra’s sensation. The foot perfectly planted on the upper sole with enough space to spread toes in a natural position. Compared to the first version, the wrap around felt firmer on the feet. Still flexible but with some more control. Laces are holding comfortably and smoothly the upper part of the foot although due to the large toe box, it can become quite tricky to tie them extremely tight on the lowest part. And they seem pretty hard to untie while running. Lose laces are my worst enemy. I dream of a future world with only BOA lacing shoes. Went out for my habitual 8 miles route, I usually do for testing. Alternating flat to a hilly, road to trail paths (no technical trail). The first thing I noticed was the new sole. Stiffer than the previous version; therefore the first thing I thought was "will this hurt after long distances?" Well, I’ll reveal this later. 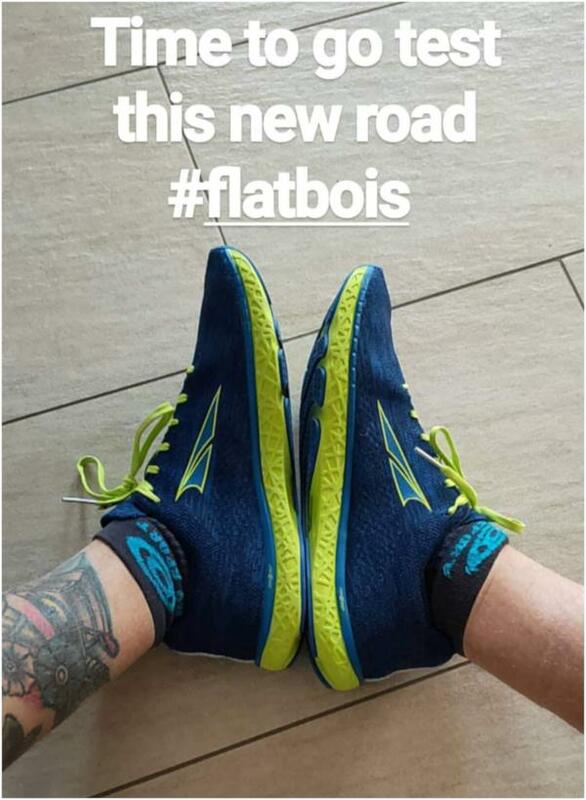 What I was sure about was the fact that thanks to this stiffness, the shoe is much bumpier and therefore faster than the older version and I was pretty confident this would have helped me to conquer new Personal Bests. And so it was. A week later I registered to a local half marathon where I’ve been able to lower my PB (1:25:08) with 5min lower than the previous I did with the Nike free RN a year before. And even after this mid-distance has done at my personal full speed, the stiffer sole supported my feet perfectly with no pain at all at the end. Another good thing about the sole is that it seems much more durable than the previous one (lasted around 200 miles) although it still has a short life compared to other thicker running shoes. But this is pretty much the best you can expect for a minimal shoe especially for heavy runners like I am. The upper fabric is comfortably enveloping the toebox giving the toes enough space to spread and breathe. The tongue is thick enough just like ankle collar to give that soft and free feeling. There is obviously not a lot of support for the ankle, but this is not what you would expect from this kind of shoe. Reflecting labels have been added on the tongue and heels to improve your security while night running. Sole is almost irreproachable. The outsole has a perfect grip even on non-technical trails. The midsole is firmer but bumpier than version 1. It gives you the perfect pop to speed up your runs. Upper sole gives your feet perfect stability. Maybe a little bit more arch support would have helped for the longer runs. The upgrade of this shoe is 100% approved and takes now the lead into my road shoe chart. The only thing I would improve is their durability without losing its minimal aspect. And since this made me even more confident about Altra’s improving their models in the right direction, I’m pretty sure I’ll buy and try their new Timp 1.5 trail running shoe very soon. The type of person we put in the Escalante, somebody who might be looking for a faster road shoe. Somebody is looking for a good training shoe for the track. Overall the Escalante is one of the better multipurpose road shoes out there. While it isn’t the best racing/speedwork shoe or one that has the tons of structure for longer days or heavy training it has enough to do most runs pretty well. I think it is one of the best shoes Altra has made so far. Designed for runners with neutral foot mechanism, the Altra Escalante 1.5 receives a major update in its upper. Having a Zero Drop platform with the same midsole and outsole technologies, the shoe continues to deliver a soft and springy ride. The new Altra Escalante now features am engineered knit upper which offers enhanced comfort and breathability. The knit material is stretchable enough to wrap the foot snugly. The Altra Escalante 1.5 has a standard running shoe length. It offers a medium fit in the heel and midfoot section, and it has a wide toe-box area. The FootShape Toe-box allows the toes to move comfortably. This running shoe is available standard medium width for both men’s and women’s versions. The FootPod technology is integrated into the outsole of the Altra Escalante 1.5. The main purpose of this technology is to map the bones tendons on the foot. The goal of which is to aid and improve in the bending and moving of the foot in a natural way. The outsole is made from a durable rubber material which is designed to deliver durability and traction. The outsole design is sturdy enough to make the shoe last longer. The Altra Escalante 1.5 has a fully-cushioned Zero Drop midsole, same as the Altra Torin 3.0. With the Zero Drop platform, the heel and forefoot are placed on the same distance from the ground. This design is to promote proper foot movement. It also reduces impact throughout the gait cycle. To give runners a soft yet responsive cushioning, Altra makes use of the Altra Ego midsole compound. This material is described as a dual-nature midsole cushioning. It is focused on providing a more responsive and bouncier underfoot feel. It also aims to deliver consistent and durable cushioning throughout the run. The InnerFlex design is also integrated into the midsole of the Escalante 1.5. It is composed of grid-like grooves strategically placed in the midsole. It allows the foot to bend naturally while running. Either for long-distance or short runs, the InnerFlex aims to provide flexibility for a smoother transition. The 6mm contour footbed offers the foot added underfoot cushioning. It also enhances the overall fit of the shoe. In the upper of the Altra Escalante 1.5 is the engineered knit material. It is designed to give the foot a comfortable and breathable environment. The knit material is stretchable enough to wrap the foot snugly. 360 reflective details are added into the upper knit material. It increases visibility, especially on low-light running conditions. This lightweight running shoe features the FootShape toe-box. The primary focus of this material is to enable the foot to relax throughout the running session. The toes can also spread out comfortably and naturally. As a result, foot positioning and stability are enhanced. The decoupled heel offers minimal construction for a fast and lightweight running experience. The collar and tongue of the shoe are moderately padded. They aim to enhance comfort and overall foot lockdown. The Altra Escalante 1.5 has a lace-up closure. 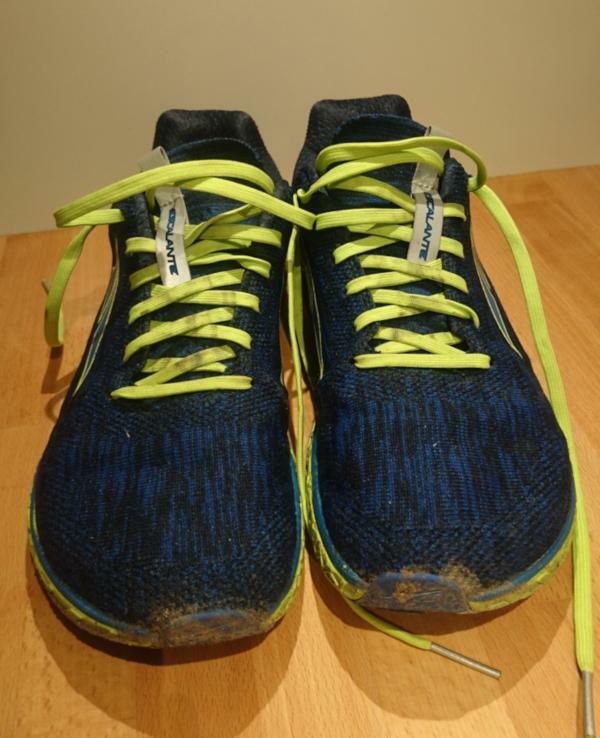 Runners can easily loosen and tighten the laces to get the perfect fit. Lace loops are also attached to the tongue of the shoe. The loops keep the laces from getting in the way while running. Escalante 1.5 is one of the dependable racing shoes from Altra. It is has a lightweight design with breathable coverage and consistent cushioning. Based on some Altra Escalante 1.5 reviews, runners positively accepted this model; they are truly delighted by the shoe’s performance. But how does Altra Escalante 1.5 compared to other racing shoes? The Zoom Fly SP is a popular competition running shoes from Nike that is sold at an expensive price. The upper of the is very lightweight and it offers breathable coverage to the foot. The shoe has a very responsive and durable cushioning. Designed for the roads, the Nike Zoom Fly SP has reliable traction for paved surfaces. The performance of the Zoom Fly SP is comparable to the Altra Escalante 1.5. Both running shoes have gathered positive reviews from users of all levels. The Fresh Foam Beacon is one of the newest running shoes from the New Balance’s competition shoes. Designed for road running, the Fresh Foam Beacon has a lightweight design, responsive cushioning, and comfortable fit. Just like the Altra Escalante 1.5, this New Balance running shoe also gained positive feedback from users. Performance-wise, the Beacon is also a good option, especially of runners who are looking for cheap running shoes for competition use. The Nike Odyssey React is a popular running shoe designed for road running. Just like the Escalante 1.5, the shoe offers an impressive and comfortable fit. It has an affordable price but performance-wise, the Odyssey React is not as impressive as the Escalante. But overall, the shoe is still worth trying, especially for runners who are looking for a budget-friendly competition shoe.